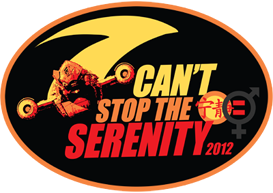 I am a global sponsor of Can’t Stop the Serenity 2012. This is an annual event where Browncoats — fans of Firefly — coordinate special screenings of the movie Serenity to raise money for Equality Now, an organization that works for the rights of women and girls around the world. Some screenings also raise money for Kids Need to Read and other charities. As a global sponsor, I’ve arranged with my publisher Carina Press to donate digital downloads of my book Stellarnet Rebel and other swag. If you’re interested in attending a screening near you, check out this list of official screenings. 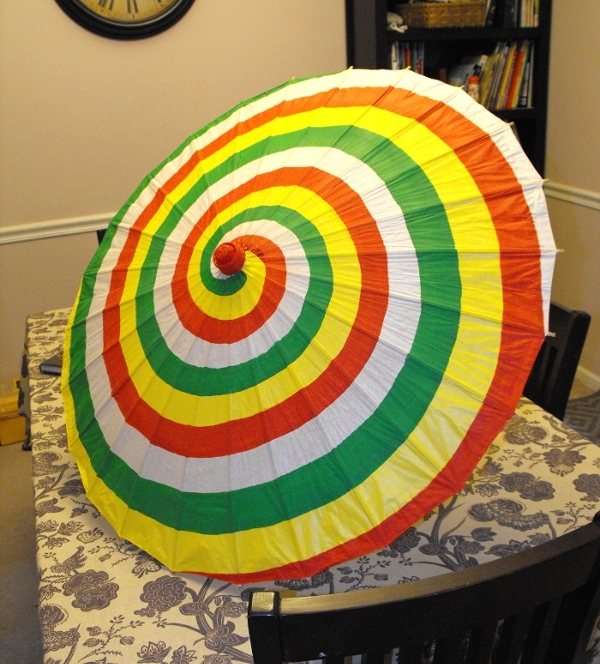 This is a replica I made of Kaylee’s parasol from the pilot episode of FIREFLY. It will be donated to my local Can’t Stop the Serenity charity event. In 2006, I organized Raleigh’s first CSTS event. Since then, I’ve coordinated and emceed our local screenings, which included a raffle, costume contest and other shiny activities, along with the movie. We have raised a combined total of more than $21,500 for Equality Now and $2,800 for Kids Need to Read. Worldwide, FIREFLY and SERENITY fans have raised a total of more than $600,000 for charity. This year, I’ve turned organizational duties over to others, but I spent the weekend painting a parasol like the one carried by Kaylee in the Firefly pilot episode, which will be donated to Raleigh’s CSTS raffle. This entry was posted in Conventions & events, News, Science Fiction, Stellarnet Rebel and tagged Browncoats, Firefly, Serenity. Bookmark the permalink. Are there going to be any screenings in Adelaide? If it’s not on the list of participating cities, you’ll have to ask the global steering committee. You can contact them through the CSTS website, which has links to CSTS Facebook and Twitter, too. I’m a global sponsor, but I’m not involved in any planning and I don’t have any details about any screening except Raleigh, NC.